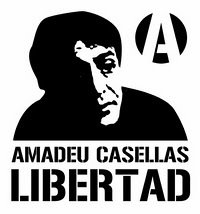 Amadeu Casellas: a life story of struggle Amadeu Casellas is a prisoner who has spent more than 25 years in jail due to his participation in dozens of bank robberies, helping with that money to the funding of worker’s struggles in the late 1970’s. None of his activities involved blood crimes. Amadeu has always been a committed and active person, participating in many actions, in the streets as well as in prisons. When he was 14, in 1973, working at a factory, he discovered anarchism. He believed in the armed struggle and in an essential revolution. In 1976 he robbed the Banco Mercantil de Manresa. During the next two and a half years he robbed more than 50 other banks. In 1979 he enters prison and is welcomed with a brutal beating. During all the time he has spent jailed, he has undertaken many hunger strikes and other types of protests, he has sewed his lips and has made countless denounces: about the prices inside prison, against the irregularities and exploitation of the inmates work, against the faking of blood analysis or penitentiary reports… All of this has caused him many “first grades” (isolation) and transfers from prison to prison, with the intention that he gave up. He has reported abuses to prisoners rights and of the entire prison system. Last year, after holding a 76 day hunger strike, Amadeu gained the compromise of the penal institution to enjoy permits that would allow him to get to the “third grade” (weekend permits, the possibility to work outside prison and just go there to sleep…) and a subsequent freedom. Such compromise was blatantly ignored by the institutions. Since july 15th, Amadeu is again on hunger strike. More than 85 days already. This particular hunger strike started after the repression he has suffered since he wrote some communiqués where he explained, with actual names, some facts related to the people in charge of the Catalonian prison system. Since july 2008, Amadeu has spent more then 200 hundred days in hunger strike! He has been in forced feeding: 3,5 litres a day since september 24th. His lawyers and family find it extremely difficult to talk to him. Many “prison workers” and jail unions have tried to sanction the lawyers. When he wants to smoke, the rest of the inmates of the penitentiary wing of the Terrassa Hospital are forced to go back to their rooms. As well as the hunger strike, Amadeu has felt forced to add a thirst strike so to be able to get visits from family and lawyers. That first thirst strike accomplished his intentions. Since Sunday October 4th, he has started another one because they’re trying to transfer him again to prison, because “his health has improved”. Some actions and demonstrations have taken place, in Spain as well as in other countries. We feel the need to ask for solidarity with this anarchist fighter. A call for decentralized actions has been made until he gets his third grade and leaves the hunger strike. It should be noted that Amadeu’s position depends solely on the Catalonian prison and political system, not of Spain’s. Anyway, actions, information and solidarity should be carried in any possible way. It might also help (as happened during last year’s hunger strike, along with many actions) to saturate this fax number and e-mail accounts with messages supporting Amadeu: 5th, blatantly ignored by the institutions. nd just go there to sleep…ding a 76 day hunger strike, Amadeu gained the compromise of the penal institution.-th the intention that he gave up.-hunger strikes and other types of protests, he has Fax number: (++34)932140179 You can send it with this program for free: http://www.myfax.com/free/ e-mail accounts: sindic@sindic.cat justicia@gencat.cat We should not leave Amadeu in the hands of the State. Adelante compeñeros, until the liberation of Amadeu and the demolition of their dirty prisons!